Since doctors and researchers first discovered that it was, in fact, medically possible to remove unwanted fat for aesthetic purposes, patients have sought the most technologically advanced, least invasive path to fat removal. Thanks to the science of SculpSure®, Charlotte patients can lose fat from their stomach and flanks in the amount of time it takes to eat lunch or run an errand. SculpSure® is an FDA-approved light-based technology that disrupts fat cells utilizing a 1060 nm wavelength laser to melt fatty tissue, which is then eliminated by the body. This particular method provides minimal disruption to the dermis, ensuring that the skin tissue above the fat is not harmed. It can be used on all skin types, and in clinical trials, patients experienced an average 24 percent reduction in fat after a single treatment. Once the fat cells have been eliminated they are permanently gone. The only way for the fat cell population to increase in any individual is when there is a substantial increase in caloric consumption whereby the existing fat cells are bulged past the point of capacity and a new fat cell is then created. When we gain and lose weight, we only shrink the existing cells. With SculpSure®, Charlotte patients can feel confident that the results in the treated area are permanent. SculpSure® is not a method for controlling weight and should not be utilized as a substitute for a healthy diet and exercise regimen. Ideal Charlotte-area patients are healthy and within range of their body weight but struggling against stubborn fat deposits on their stomach and flanks. SculpSure® has also been used on the upper arm fat, bra overhang fat, and the inner and outer thigh. How Can a SculpSure® Treatment in Charlotte, NC, Benefit Me? A treatment at Charlotte's Saluja Cosmetic & Laser Center usually requires just 25 minutes to complete and costs significantly less than a more intensive body contouring procedure like liposuction. During the consultation phase, the doctor and patient agree on a treatment method that best addresses the patient's concerns and schedule the first treatment. Unlike many more intensive procedures, SculpSure® does not result in any downtime for patients, allowing them to immediately resume a normal routine and activities. After a treatment, the full results of the procedure typically require 12 weeks to fully materialize. Also, unlike many other procedures, depending on an individual's needs and expectations, there is a reasonable chance that patients will achieve their goals in a single session, although some Charlotte SculpSure® patients do choose to return for subsequent treatments to enhance their results. SculpSure® relies on a hyperthermic method of treatment, heating the fat cells, which causes them to expand and rupture. The body then naturally begins to filter them and clear them out, and the fat dissipates naturally over time. Patients may have heard of a similar treatment that uses cold as opposed to heat to destroy fat cells: CoolSculpting®. 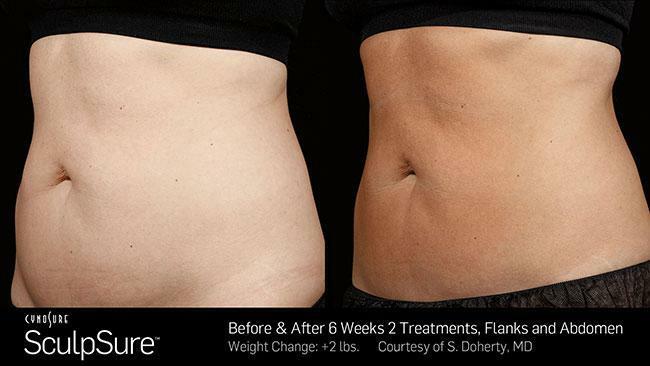 While this is a popular treatment, SculpSure® has outperformed it in recent studies, winning with a 24 percent reduction in pinchable fat (compared to CoolSculpting's 22 percent), a 25-minute treatment time including up to four applicators (as opposed to one hour per applicator), a more affordable pricing scale, and greater patient tolerance, attributable to selective fat targeting by SculpSure® as opposed to the other method, which can create discomfort as it cools all tissue in its path. While SculpSure® is currently only approved for treatment of the abdomen and flanks, patients interested in body contouring treatments for other regions of the body can discuss alternative and complementary procedures during a consultation. During a SculpSure® treatment, many patients report experiencing a tingling sensation. However, the degree of heat released during the procedure is not sufficiently significant to produce any greater discomfort or side effects beyond some potential mild redness, tenderness, and swelling at the treatment area. During the treatment, contact cooling and intermittent cooling technology is also utilized to minimize the heat from the laser.